Samsung has once again regained some percentage control over the smartphone market. Samsung Galaxy S9 Plus and Samsung Galaxy S9 became the best-selling smartphone in April 2018, leaving the smartphone like Apple iPhone X and Xiaomi Redmi. Although the Samsung Galaxy S9 is less sales than the company's expectations, but this smartphone has surpassed other smartphones in terms of sales. According to the report released by Counterpoint Market Plus, Samsung Galaxy S9 Plus has become the best-selling smartphone. On the other hand, iPhone X has moved from number one to third. According to this report, Samsung Galaxy S9 Plus has become the bestselling smartphone in the global market. 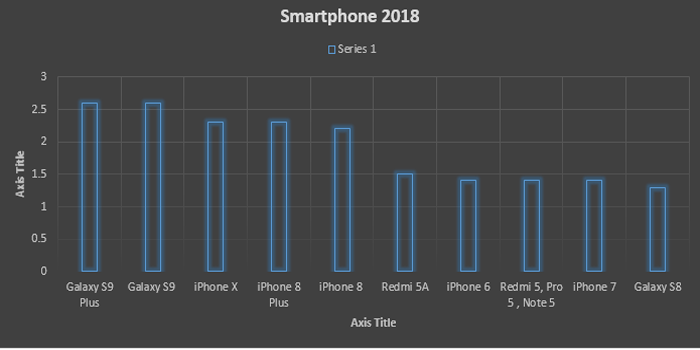 The series went far beyond the global market of iPhone X. Sales of these smartphones have increased in the Asia Pacific and North American region. Because of this, these smartphones have managed to surpass Apple's iPhone X. According to this current Samsung selling data, Samsung Galaxy S9 Plus's global market share was 2.6 percent in April 2018. Samsung Galaxy S9's market share is also 2.6 percent. Both of these smartphones were first and second respectively in the list of smartphones sold this month. After this, the number comes in the case of the iPhone X, whose market share is 2.3, while the iPhone 8 Plus market share is also 2.3. While the iPhone 8 was at the fifth position with a market share of 2.2 percent, the market share of Xiaomi Redmi 5A was 1.5 percent. This is the first time that only two smartphones of Xiaomi have joined the Top 10 list. Xiaomi’s market has increased due to its cheap smartphone in India and China, but the sales of smartphones in the global market have come down. Samsung has launched several smartphones in its flagship recently, hopefully Samsung will retain its dominance in the coming months. Samsung Galaxy Note 9 can be launched in the second half of the year.